The training was conducted by Saima, who is one of our experienced instructors for Health and Community Care Programs. 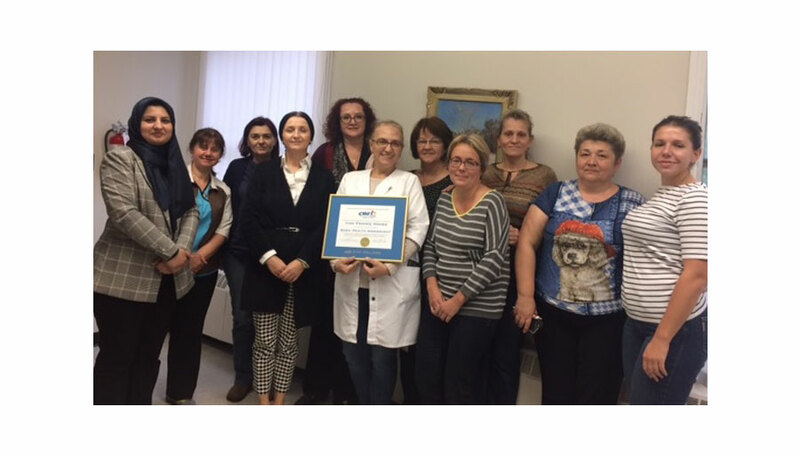 Based on the specific requirements from Ivan Franko Homes, the workshop was customized to suit the unique needs of their long term care facility where the average age of the residents is close to 91 years of age. CIMT College was thrilled for this opportunity to work with the Ivan Franko Homes staff. CIMT College offers many training courses and workshops in Health and Community Care such as Wound Care Workshop, Phlebotomy Workshop, Intramuscular Injection Workshop, ECG, and many more. Our strength is our content and flexibility in delivering the training as per client needs. We offer choice in delivering the training on-site or off-site, during the weekdays or weekends, and in the morning, afternoon or evening. Call or email our corporate team if your organization needs any customized training, and we will be pleased to provide a quotation.